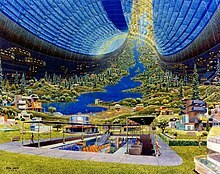 The Stanford torus was proposed during the 1975 NASA Summer Study, conducted at Stanford University, with the purpose of exploring and speculating on designs for future space colonies (Gerard O'Neill later proposed his Island One or Bernal sphere as an alternative to the torus). 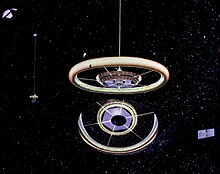 "Stanford torus" refers only to this particular version of the design, as the concept of a ring-shaped rotating space station was previously proposed by Wernher von Braun and Herman Potočnik. Sunlight is provided to the interior of the torus by a system of mirrors, including a large non-rotating primary solar mirror. The ring is connected to a hub via a number of "spokes", which serve as conduits for people and materials travelling to and from the hub. Since the hub is at the rotational axis of the station, it experiences the least artificial gravity and is the easiest location for spacecraft to dock. Zero-gravity industry is performed in a non-rotating module attached to the hub's axis. The torus would require nearly 10 million tons of mass. Construction would use materials extracted from the Moon and sent to space using a mass driver. A mass catcher at L2 would collect the materials, transporting them to L5 where they could be processed in an industrial facility to construct the torus. Only materials that could not be obtained from the Moon would have to be imported from Earth. Asteroid mining was an alternative source of materials. Stanford torus structural cross section. Transportation system for the torus construction (1975). A torus expanding from interconnected bolas or dumbbells. A NASA lunar base concept with a mass driver (the long structure that extends toward the horizon). Cutaway view of a Stanford torus. ^ Johnson, Holbrow (1977). "Space Settlements: A Design Study". National Aeronautics and Space Administration. ^ Johnson. NASA Study, pg VII, "Preface"
^ Johnson, Richard D.; Holbrow, Charles (1977). "Space Settlements: A Design Study" (PDF). NASA Technical Reports Server. p. 201. Retrieved October 20, 2012. Wikimedia Commons has media related to Stanford Torus.